The Caversham Picture Framer is a family run business specialising in traditional hand-finished frames to enhance your artworks and spaces with the most modern conservation techniques to ensure they endure. In addition to bespoke framing, they are pleased to announce that their shop will be hosting exhibitions to support local artists. Their latest exhibition which is on until 31 August 2018 showcases the work of up-and-coming, young artist Lauren Philliban. Lauren specialises in the combined medium of watercolour and ink. 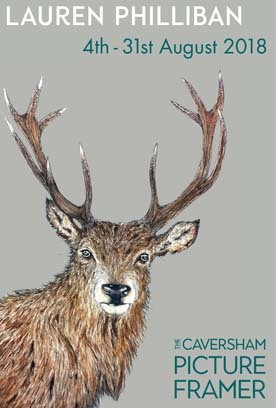 Having travelled widely in the UK, Lauren’s work is inspired by a range of creatures from Norfolk puffins to rutting stags. Her unique style includes using colourful splatters to express the characteristics of the animal she is portraying, both in her original work and pet portraits. Being surrounded by wildlife has influenced her work as she strives to capture the essence of the natural world.